1. In a sauce pan, mix the coconut oil, coconut milk, vanilla and coconut sugar on a low heat. Combine ingredients until the coconut oil has melted. Take off heat and mix in the desiccated coconut. 2. Line a shallow baking tray or baking tin with baking paper. Halve the mixture, and press half of it into the baking tray. Place in freezer. 3. Prepare your juicer and juice the beetroot. Add 2 tablespoons of the juice to the remainder of the mixture, combine well. Note: If you do not have a juicer, slice up the beetroot and boil in a pot for 5 minutes. Add 3 tablespoons of the water to the remainder of the mixture. The water would have turned red from the beetroot, making the mixture a pink colour. 4. Add the pink mixture to the base and press it in well. Place the coconut ice into the freezer for at least 2 hours before serving. 5. 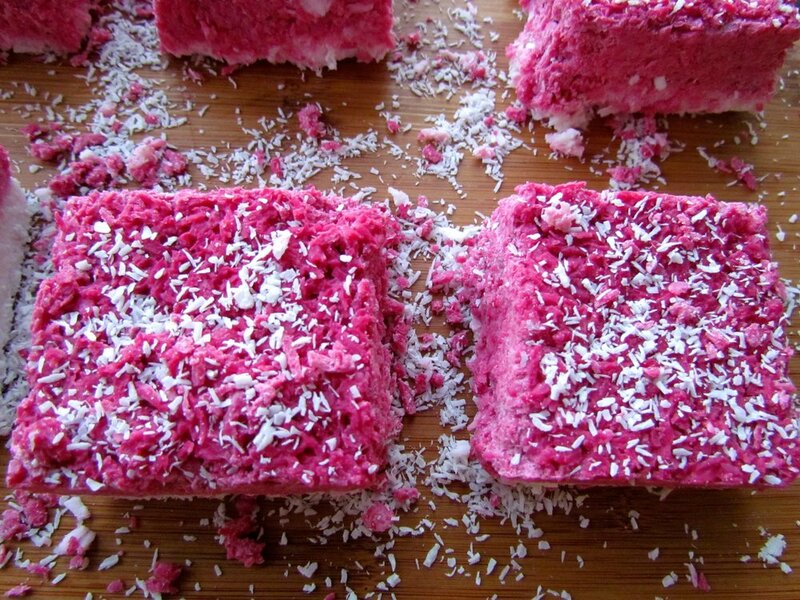 Cut the coconut ice into squares and store in the fridge. It will melt if it is kept in room temperature for too long. With the silly season just around the corner, I thought it would be appropriate to share a recipe that is delicious, easy to make, and can be taken to upcoming summer BBQ's and parties. I wanted to make a healthier version of the classic coconut ice recipe by replacing the original recipes refined sugar with coconut sugar and red food colouring with beetroot juice. The beetroot juice gives the slice a beautiful, vibrant pink colour. This is a chewy treat that is quick to make and super moreish. It is perfect for a sweet afternoon treat served with a herbal tea or wrapped up as a Christmas gift.